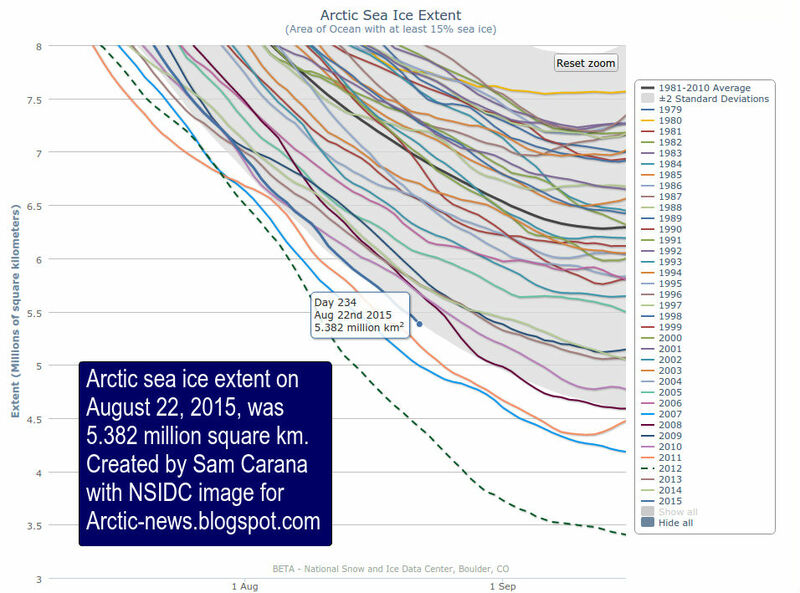 The image below shows Arctic sea ice extent, with the blue dot indicating that extent for August 22, 2015, was 5.382 million square kilometers. 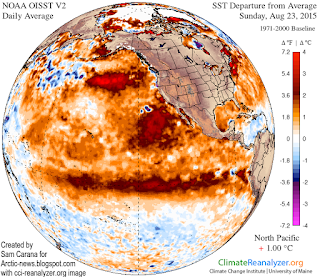 The record shows that, at this time of the year, extent was only lower in 2007, 2011 and 2012. There are a number of reasons why sea ice could fall dramatically over the next few weeks. First of all, the situation today is in an even worse condition than one might conclude when looking at sea ice extent alone. 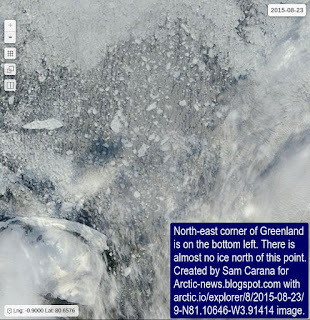 The way NSIDC calculates extent is by first dividing the satellite image into a grid and then including each cell in extent that has 15% or more ice. So, if a few small and very thin pieces of ice floating in a cell happen to cover 15% of a cell, it is counted in as "sea ice". There is quite a difference between the sea ice that was 5 meters thick north of Greenland in 2012 and the ice that is present there now. 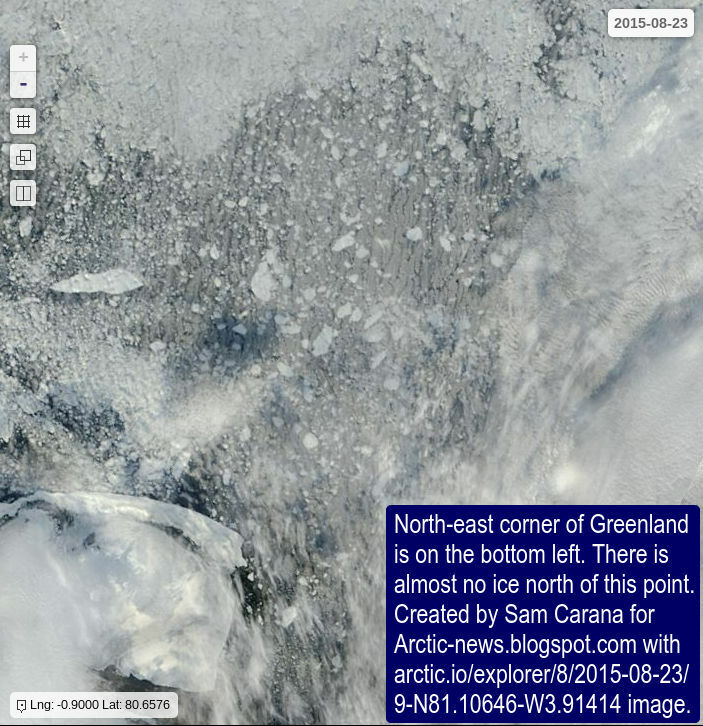 The image on the right shows the north-east corner of Greenland on the bottom left. There is almost no ice north of this point. Thick sea ice is virtually absent compared to the situation in the year 2012 around this time of year, as illustrated by the image below that compares sea ice thickness on August 20, 2012 (left) with August 20, 2015 (right), from an earlier post. Furthermore, sea surface temperatures are very high. 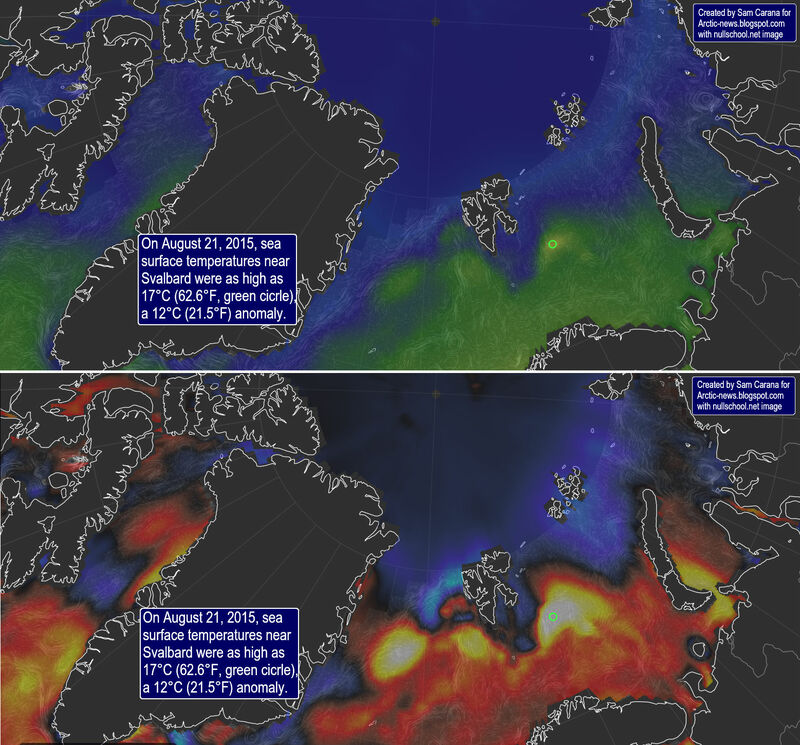 The North Pacific, on August 23, 2015, was exactly 1°C (1.8°F) warmer than it was compared to the period from 1971 to 2000 (see Climate Reanalyzer image right). 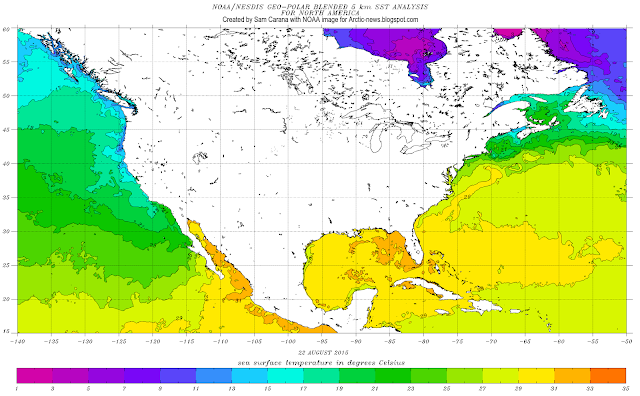 As the image below shows, sea surface temperature anomalies are very high around North America. 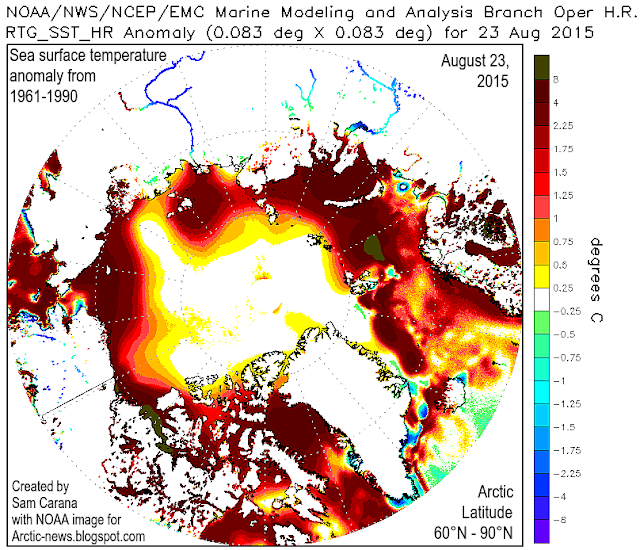 On August 23, 2015, sea surface temperature anomalies as high as 6.4°C (11.5°F) were recorded in the Bering Strait. This is where warm waters from the Pacific Ocean are flowing into the Arctic Ocean. The Gulf Stream is carrying much of this warm water toward the Arctic Ocean. 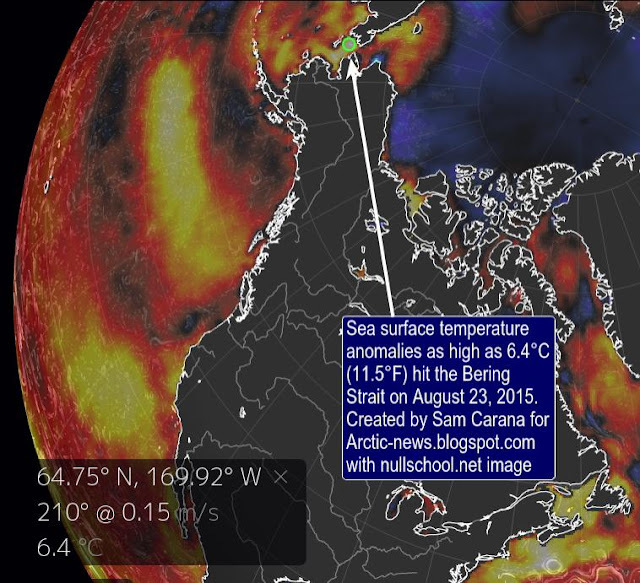 On August 21, 2015, sea surface temperatures near Svalbard were as high as 17°C (62.6°F), a 12°C (21.5°F) anomaly, at the location marked by the green circle on the image below, showing sea surface temperatures in the top panel and sea surface temperature anomalies in the bottom panel. The image below shows sea surface temperature anomalies in the Arctic as at August 23, 2015. More open water increases the chance that storms will develop that will push the last remnants of the sea ice out of the Arctic Ocean, as discussed in earlier posts such as this one, while storms can also mix warm surface waters all the way down to the seafloor, as discussed in this earlier post. The Climate Reanalyzer forecast for August 26, 2015, on the right shows strong winds both in the Bering Strait and the North Atlantic. 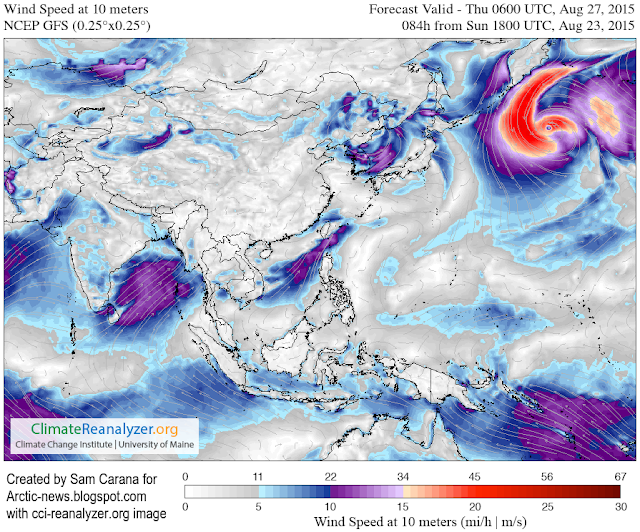 Typhoons increase this danger. 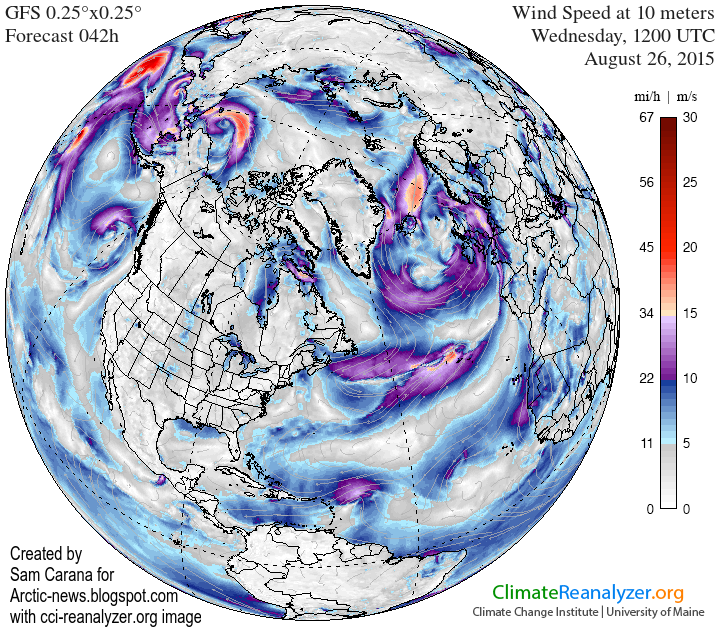 The Climate Reanalyzer forecast for August 27, 2015, below shows a typhoon in the Pacific Ocean close to the Arctic Ocean. Your fourth graphic shows 6.4C is equal to 11F. I think you forgot to add back the 32 degrees F. All of this is such a nightmare. I think mankind will be extinct within 100 years, except for a few pockets of survivors, who live mostly underground. The question at that point, will be the rapidly increasing H2S, and if that makes it impossible for any humans to survive. Sounds like a bad science fiction script, but it is really happening. convert-me.com/en/convert/temperature-inc which shows that a 6.4°C anomaly translates into a 11.52°F anomaly. This is different from converting a direct temperature measurement conversion from one scale to another (Celsius, Fahrenheit, etc.). convert-me.com/en/convert/temperature can be used for the latter. The situation looks like it is too late, save by the Grace of God an alignment occurs to make the world of ingenuity-of-youth and will-to-live have framework Real at law 2C cost analysis. The people going to COP 21 Paris don't have a chance in heck to interrupt extinction 6 under the umbrella of Corporate Law and monetary design as it stands. Stands sovereign.